Laverne: [to Quasimodo] Quasi, take it from an old spectator. Life's not a spectator sport. If watchin' is all you're gonna do, then you're gonna watch your life go by without ya. Phoebus: [about Esmeralda] What a woman! Quasimodo: [to Esmeralda] Quick! This way! Phoebus: Oh, and one more thing: tell Esmeralda - she's very lucky. Phoebus: To have a friend like you. Quasimodo: [whispering to Frollo; bitterly but firmly] You killed her. Frollo: It was my duty. Horrible as it was, I hope you'll forgive me. Hugo: Good night, everybody! Wah-ha-hoo! Oafish Guard: [to Esmeralda] Come back here, gypsy! Laverne: [singing] Call me a hopeless romantic but Quasi, I feel it. Victor: [singing] She wants you so / Any moment she'll walk through that door. Hugo: [singing] A guy so swell. Hugo, Victor, Laverne: [singing] A guy like you. Hugo: [singing] With all you bring her. Victor, Laverne: [singing] I tell you Quasi. Hugo: [singing] A fool could tell. Victor, Laverne: [singing] There never was. Hugo: [singing] It's why she fell. Victor, Laverne: [singing] Another, was he? Victor, Laverne: [singing] From king to serf to the bourgeoisie. Hugo: [singing] You ring the bell. Victor, Laverne: [singing] They're all a second-stringer. Hugo, Victor, Laverne: [singing] You're the bell ringer! / When she wants ooh-la-la / And she wants you la-la / She will discover, guy / You're one heck of a guy / Who wouldn't love a guy like you? Hugo: [singing] You got a lot / The rest have not / So she's gotta love a guy like you! Frollo: Captain Phoebus, arrest her! Man In Crowd: That's no mask. Woman In Crowd: It's his face! He's hideous! Man In Crowd: It's the bellringer from Notre Dame! Clopin: [appearing onstage reassuring the audience, then soon crowning Quasi] Ladies and gentlemen, don't panic. We asked for the ugliest face in Paris, and here he is! Quasimodo, the hunchback of Notre Dame! Esmeralda: What is this place? Quasimodo: This is where I live. Esmeralda: Did you make all these things yourself? Esmeralda: This is beautiful. Oh, if I could do this, you wouldn't find me dancing in the streets for coins. Quasimodo: But you're a wonderful dancer. Esmeralda: Well, it keeps bread on the table, anyway. What's this? Quasimodo: Oh! No, please...! I-I-I'm not finished. I-I-I still have to paint them. Esmeralda: It's the blacksmith. And the baker! You're a surprising person, Quasimodo. Hugo: [singing] A guy like you she's never known, kid / A guy like you a girl does not meet every day / You've got a look that's all your own, kid / Could there be two? Hugo, Victor, Laverne: [singing] Like you? No way! Hugo: [singing] Those other guys that she could dangle all look the same from every boring point of view / You're a surprise from every angle / Mon Dieu above she's gotta love a guy like you. Victor: [singing] A guy like you gets extra credit / Because it's true you've got a certain some thing more. Victor, Laverne: [singing] Want something new? Hugo, Victor, Laverne: [singing] For sure! Laverne: [singing] We all have gaped at some Adonis. Victor: [singing] But then we crave a meal more nourishing to chew. Hugo: [singing] And since you're shaped like a croissant is. Hugo, Victor, Laverne: [singing] No question of she's gotta love a guy like you! Frollo: [to Esmeralda] You've chosen a magnificent prison, but it is a prison nonetheless. Set one foot outside, and you're mine. Oafish Guard: Get off me! Laverne: [to the birds] Fly, my pretties! Fly, fly! Clopin: [singing] Morning in Paris, the city awakes / To the bells of Notre Dame / The fisherman fishes, the bakerman bakes / To the bells of Notre Dame / To the big bells as loud as the thunder / To the little bells soft as a psalm / And some say the soul of the city's the toll of the bells / The bells of Notre Dame. Esmeralda: What are you doing? Frollo: [caressing her neck] I was just imagining a rope around that beautiful neck. Esmeralda: [snarls] I know what you were "imagining." Hugo: Hey hey! There he is! Victor: Gizmo! You ejected that tin-plated baboon with great panache! Hugo: The nerve of him, snooping around here trying to steal your girl. Laverne: Esmeralda. Dark hair, works with a goat. Remember? Hugo: Boy, I do! Way to go, lover boy! Quasimodo: "Lover boy"? Oh, no, no, no, no. Laverne: Aw, don't be so modest. Quasimodo: Look, I appreciate what you're all trying to do, but let's not fool ourselves. "Ugliest face in all of Paris", remember? I don't think I'm her type. Frollo: And he shall smite the wicked and plunge them into the fiery pit! Clopin: [to the Gypsies] Gather around, everyone. There's "good noose" tonight! It's a double-header. A couple of Frollo's spies. Clopin: And not just any spies. His captain of the guards, and his loyal, bell-ringing henchman. Laverne: Impossible. If twenty years of listening to you two hasn't made him sick by now, nothing will. Hugo: You could wear a disguise, just this once. What Frollo doesn't know can't hurt ya. Hugo: [to the side] Look who's talkin'. Phoebus: [pulling Quasi up onto the balcony after he helps Esmeralda escape Notre Dame] Hi there. I'm looking for the gypsy girl. Have you seen her? Phoebus: Whoa, whoa, whoa, easy! Quasimodo: [grabbing a torch] No soldiers! Sanctuary! Get out! Phoebus: I mean her no harm. Quasimodo: [growls, then waves the torch wildly at Pheobus] Rrrrrr... GO! Phoebus: You tell her for me, that I didn't mean to trap her here. But it was the only way I could save her life. Will you tell her that? Will you? Quasimodo: If you go. Now. Phoebus: I'll go. Now, will you - put me down, please? Frollo: The time has come, Gypsy. You stand upon the brink of the abyss. Yet even now it is not too late. I can save you from the flames of this world, and the next. Choose me, or the fire. Hugo: [singing] Paris, the city of lovers, is glowing this evening / True, that's because it's on fire, but still there's l'amour / Somewhere out there in the night / Her heart is also alight / And I know the guy she just might be burning for. Frollo: [after locking in the miller and his family] Burn it. Frollo: Until it smolders, these people are traitors, and must be made examples of. Phoebus: With all due respect, sir, I was not trained to murder the innocent. Frollo: But you were trained to follow orders. Clopin: [singing] Justice is swift in the Court of Miracles / I am the lawyers and judge all in one / We like to get the trial over with quickly / Because it's the sentence that's really the fun! Frollo: [to Quasimodo] Oh, my dear Quasimodo. You don't know what it's like out there. I do. I do. Frollo: The world is cruel, the world is wicked / It's I alone that you can trust in this whole city. / I am your only friend. / I who keep you, teach you, feed you, dress you / I who look upon you without fear. / How can I protect you boy, unless you always stay in here. / Away in here. Quasimodo's Mother: [trying to escape Frollo] Sanctuary! Please give us sanctuary! Quasimodo: [hollering loudly after rescuing Esmeralda from Frollo; the people answer his shouts by cheering] SANCTUARY! SANCTUARY! SANCTUARY! Frollo: Ah, duty calls. Have you ever attended a peasant festival, captain? Frollo: Then this should be quite an education for you. Come along. Clopin: Three cheers for Quasimodo! Laverne: Quasi, what's wrong? Wanna tell ole Laverne all about it? Quasimodo: I... I just don't feel like watching the festival, that's all. Laverne: Well, did you ever think of going there instead? Quasimodo: Sure, but I'd never fit in out there. I'm not... normal. Laverne: Do ya mind? I would like to have a moment with the boy, if it's all right with you! Oafish Guard: All right, gypsy, where'd you get that money? Esmeralda: For your information, I earned it. Oafish Guard: Gypsies don't earn money. Brutish Guard: They steal it. Clopin: [after Esmeralda's dance at the Festival of Fools] And now, ladies and gentlemen, the pi-ece de resistance! Phoebus: [as the guards chase after Esmerelda and pass behind Phoebus' horse, Achilles] Achilles, sit! Brutish Guard: Hey... Whoah! Ow! Phoebus: Naughty horse! Naughty! He's just impossible, I can't bring him anywhere! Phoebus: Easy, easy, I just shaved this morning. Esmeralda: Oh really? You missed a spot. Phoebus: Alright, alright, just calm down, just give me a chance to apologize. Phoebus: That, for one hand. Phoebus: Ah, ah, ah! Watch it. We're in a church. Esmeralda: Are you always this charming, or am I just lucky? Phoebus: Hahahaa, candlelight! Privacy! Can't think of a better place for hand to hand combat... You fight almost as well as a man! Esmeralda: Funny. I was going to say the same thing about you! Phoebus: That's hitting a little below the belt, don't you think? Phoebus: Touche! Oof!... I didn't know you had a kid. Esmeralda: He doesn't take kindly to strangers. Esmeralda: what's a girl to do? Clopin: [singing] So, here is a riddle to guess if you can, sing the bells of Notre Dame: What makes a monster and what makes a man? Whatever their pitch, you feel them bewitch you, the rich and the ritual knells of the bells of Notre Dame. Frollo: [announcing to the gypsies at the Court of Miracles] There'll be a little bonfire in the square tomorrow, and you're all invited to attend. Quasimodo: [rushing forward] No! Please, Master! Frollo: [to his remaining guards] Take him back to the bell tower, and make sure he says there. Quasimodo: [tearfully, before he heads back to the cathedral in humiliation] I'm sorry, Master. I will never disobey you again. Esmeralda: To the Court of Miracles. Leave this place. Quasimodo: Oh, no. I'm never going back out there again, because of what happened today. No. This is where I belong. Esmeralda: All right, then I'll come to see you. Quasimodo: Here? But what about the soldiers and Frollo? Esmeralda: I'll come after sunset. Quasimodo: Whatever's good for you. Frollo: Remember what I've taught you, Quasimodo. Quasimodo: [singing] I am deformed. Quasimodo: [singing] And I am ugly. Quasimodo: [singing] You are my one defender. Quasimodo: [singing] I am a monster. Quasimodo: [singing] Only a monster. Frollo: [singing] Do as I say, obey, and stay. Frollo, Quasimodo: [singing] In here. Frollo: [to his soldiers after Pheobus escapes on Frollo's steed] Get him! And don't hit my horse! Laverne: Nobody wants to stay cooped up here forever. Quasimodo: [gets up excitedly] You're right! I'll go! Victor: Are you sure that's how it works? Esmeralda: [grabs Phoebus' sword and pushes him to the floor] Oh you! Phoebus: Easy! Easy! I just shaved this morning. Esmeralda: Oh, really? You missed a spot. Phoebus: All right just - calm down. Just give me a chance to apologize. Phoebus: [kicks Esmeralda, making her stumble] That, for example. Phoebus: Ah ah ah! Watch it. You're in a church. Phoebus: I'm sorry sir, she claims sanctuary. There's nothing I can do. The Archdeacon: Frollo! You will not touch her! The Archdeacon: Don't worry. Minister Frollo learned years ago to respect the sanctity of the church. Laverne: Take it from us, Quasi. You've got nothing to worry about. Victor: [chuckles] Knights in shining armor certainly aren't her type. Hugo: And those guys are a dime a dozen, but you - you're one of a kind. Pheobus, who is hidden under the table] I think... you're hiding something. Frollo: [interrupting] You're not eating, boy. Quasimodo: [gobbling his grapes] 'Tis very good. Thank you. Oafish Guard: Sir, we have looked everywhere and there's still no sign of the gypsy girl. Phoebus: [as he and Quasi wade through the catacombs at the Court of Miracles] Cheerful place. Phoebus: Kinda makes you wish you got out more often, eh, Quasi? Quasimodo: Not me. All I want to do is warn Esmeralda then get back to the bell tower before I get in any further trouble. The Archdeacon: [coming downstairs] Frollo, have you gone mad? I will not tolerate this assault on the house of God! Frollo: [flinging the Archdeacon down the stairwell] Silence, you old fool! The hunchback and I have unfinished business to attend to. And this time, you will not interfere. Quasimodo: [sings] And out there living in the sun / Give me one day out there / All I ask is one to hold forever / Out there where they all live unaware / What I'd give, what I'd dare, just to live one day out there. Frollo: I should have known you would risk your life to save that Gypsy witch, just as your own mother died trying to save you. Frollo: Now I'm going to do what I should have done... twenty years ago! Esmeralda: [singing] I don't know if you can hear me / Or if you're even there / I don't know if you would listen / To a Gypsy's prayer / Yes, I know I'm just an outcast / I shouldn't speak to you / Still, I see your face and wonder / Were you once an outcast, too? Phoebus: You fight almost as well as a man. Esmeralda: Funny, I was going to say the same thing about you. Quasimodo: Is this the Court of Miracles? Phoebus: Offhand, I'd say it's the Court of Ankle-deep Sewage. Must be the old catacombs. Phoebus: You leave town for a couple of decades and they change everything. Phoebus: [as Quasimodo is cruelly humiliated by the crowd] Sir, request permission to stop this cruelty. Frollo: In a moment, captain. A lesson needs to be learned here. Quasimodo: If I got caught. Victor: Better to beg forgiveness than ask permission. Frollo: You, Gypsy girl! Get down at once! Esmeralda: Yes, Your Honor. Just as soon as I free this poor creature. Frollo: How dare you defy me? Esmeralda: You mistreat this poor boy the same way you mistreat my people. You speak of justice, yet you are cruel to those most in need of your help! Frollo: Mark my words, Gypsy, you will pay for this insolence. Esmeralda: Then it appears we've crowned the wrong fool. The only fool I see is you! [after the night with the visions] Phoebus: Good morning, sir. Are you feeling all right? Frollo: I had a little trouble with the fireplace. Gypsies: So you're going to hang! Hugo: Hey isn't that, uh, Feeble? Esmeralda: Hey! Are you all right? Quasimodo: [hiding his face with his hood] I-I didn't mean to, I, I'm sorry. Esmeralda: Oh you're not hurt, are you? Here, here, let's see. Quasimodo: No, no! - N-no! Esmeralda: There. See? No harm done. Esmeralda: Just try to be a little more careful. Quasimodo: I, I... I-I will. Esmeralda: By the way... great mask. Frollo: [supervising someone being whipped, just as Phoebus arrives] Stop. Frollo: Ease up. Wait between lashes. Otherwise, the old sting will dull him to the new. Frollo: [turns to Phoebus] Ah, so this is the gallant Captain Phoebus, home from the wars. Phoebus: Reporting for duty as ordered, sir. Frollo: Your service record precedes you, Phoebus. I expect nothing but the best from a war hero of your caliber. Phoebus: And you shall have it, sir. I guarantee it. Frollo: Yes. You know, my last captain of the guards was, um, a bit of a disappointment to me. Frollo: Well, no matter, I'm sure you'll... whip my men into shape. Phoebus: Well, that's a great... tremendous honor, sir. Esmeralda: Let's see. One, two, three, four, five, six, seven, eight, nine... So there's ten of you and one of me. What's a poor girl to do? 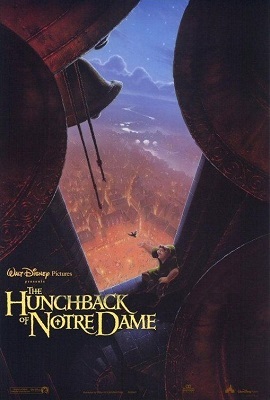 Quasimodo: [Introducing the bells to Esmeralda] That's Little Sophia. And Jeanne-Marie, Anne-Marie, Louise-Marie. Triplets, you know. Esmeralda: And who is this? Esmeralda: [Inside the bell] Hello! Clopin: Listen. They're beautiful, no? So many colors of sound, so many changing moods. Because, you know, they do not ring all by themselves. Clopin: No, you silly boy. Up there, high, high in the dark bell tower, lives the mysterious bell ringer. Who is this creature? Clopin: How did he come to be there? Clopin: Clopin will tell you. It is a tale, a tale of a man, and a monster. Clopin: [singing] Once a year we throw a party here in town / Once a year we turn all Paris upside-down / Every man's a king and every king's a clown / Once again it's Topsy-turvy Day! Clopin: [to Quasimodo and Phoebus] You're very clever to have found our hideaway. Unfortunately, you won't live to tell the tale. Esmeralda: [reading Quasimodo's palm] Hmm. Hmm, mmm, mmm. Well, that's funny. Esmeralda: Monster lines. Not a single one. Esmeralda: [holds out her hand while Quasi briefly studies his own] Now, you look at me. Do you think I'm evil? Esmeralda: And a Gypsy. And maybe Frollo's wrong about the both of us. Frollo: [singing] God have mercy on her / God have mercy on me / But she will be mine or she... will... BURN! Hugo: You're human, with the flesh, and the hair, and the navel lint. We're just part of the architecture. Right, Victor? Victor: Yet, if you kick us, do we not flake? If you moisten us, do we not grow moss? Brutish Guard: Minister Frollo, the gypsy has escaped. Brutish Guard: She's nowhere in the cathedral. She's gone. Frollo: Never mind. Get out you idiot. I'll find her. I'll find her if I burn down all of Paris! Quasimodo: [singing] Out there among the millers and the weavers and their wives / Through the roofs and gables I can see them / Every day they shout and scold and go about their lives / Heedless of the gift it is to be them / If I was in their skin, I'd treasure every instant / Out there, strolling by the Seine, taste a morning out there / Like ordinary men, who freely walk about there / Just one day, and then I swear I'll be content / With my share / Won't resent, won't despair, old and bent, I won't care / I'll have spent one day out there! Quasimodo: You are good to me master. I'm sorry. Frollo: You're forgiven. But remember Quasimodo, this is your sanctuary. Esmeralda: Shh. Shh. Shh. You'll hide here until you're strong enough to move. Phoebus: Great. I could use a drink. Phoebus: Yes! Mmmm. Feels like a 1470 Burgundy. Not a good year. Esmeralda: Maybe Frollo's wrong about the both of us. Hugo: What did she say? Laverne: Frollo's nose is long, and he wears a truss. Hugo: Ha! Told ya. Pay up. Hugo: [takes the coin] Chump! Hugo: Man! I thought he'd never leave. I'll be spitting feathers for a week. Victor: Well, that's what you get for sleeping with your mouth open. Hugo: Ha-ha-ha. Go scare a nun. Frollo: Dear boy, whomever are you talking to? Frollo: [taps the head of one of the gargoyles] And what are your friends made of, Quasimodo? Frollo: That's right. You're a smart lad. Clopin: And Frollo gave the child a cruel name, a name that means "half-formed". Quasimodo. Frollo: The Gypsies live outside the normal order. Their heathen ways inflame the people's lowest instincts. And they must be stopped. Phoebus: I was summoned from the wars to capture fortune-tellers and palm readers? Frollo: ...one by one. And yet, for all my success, they have thrived. Frollo: I believe they have a safe haven within the walls of this very city. A nest, if you will. They call it the Court of Miracles. Phoebus: What are we going to do about it, sir? Phoebus: You make your point quite vividly, sir. Hugo: Hey, Quasi, what's goin' on out there? A fight? A flogging? Hugo: You mean the Feast of Fools? Hugo: All right, all right! Pour the wine and cut the cheese. Victor: It is a treat to watch the colorful pageantry of the simple peasant folk. Hugo: [shoving Quasi aside] Boy, nothin' like balcony seats for watching the ol' F.O.F. Hugo: Oh, look, a mime. Frollo: This is an unholy demon. I'm sending it back to hell, where it belongs. The Archdeacon: [singing] See, there, the innocent blood you have spilt on the steps of Notre Dame. Frollo: I am guiltless. She ran, I pursued. The Archdeacon: [singing] Now you would add this child's blood to your guilt on the steps of Notre Dame! Frollo: My conscience is clear. The Archdeacon: [singing] You can lie to yourself and your minions, you can claim that you haven't a qualm, but you never can run from nor hide what you've done from the eyes! The Archdeacon: The very eyes of Notre Dame! Quasimodo: Sh! I'm coming with you. Phoebus: Glad you changed your mind. Quasimodo: But I'm not doing it for you, I'm doing it for her. Phoebus: You know where she is? Quasimodo: [presenting Esmeralda's map to Pheobus] No, but she said that this will help us find her. Phoebus: [holding up Esmerelda's map] Good, good, good. Ahhhh, great. What is it? Phoebus: [examining the map] Hmm, must be some sort of code. Maybe it's Arabic. No, no, it's not Arabic, maybe it's ancient Greek. Quasimodo: [remembering Esmeralda's quote] "When you wear this woven band, you hold the city in your hand." Phoebus: What're you talking about? Quasimodo: [arguing while Pheobus babbles] Look, I've lived up in the bell tower for 20 years, and I think I know what the city looks like from above, and this is it! Phoebus: [with Quasi] This is not it. Phoebus: All right. Okay. If you say it's a map, fine; it's a map. But if we're going to find Esmeralda, we'll have to work together. Truce? Phoebus: [as he and Quasi walk away to the Court of Miracles] No, you're not. Laverne: Look, he's got a friend with him! Hugo: Yeah, maybe today wasn't a total loss, after all. Victor: A vision of loveliness. Hugo: The one in the dress ain't bad, either. Frollo: It is the Gypsy girl / The witch who sent this flame. Frollo: He made the Devil so much stronger than a man. Hugo: Come on, Quasi, snap out of it! Victor: Your friends are down there! Quasimodo: [despondently] It's all my fault. Laverne: [as she, Hugo, and Victor try tugging the chains] You gotta break these chains! Quasimodo: [sulkingly] I can't. I tried. What difference would it make? Victor: But you can't let Frollo win! Quasimodo: [despondently again] He already has. Hugo: [dropping the chains] Say, you're giving up? That's it? Laverne: These chains aren't what's holding you back, Quasimodo. Quasimodo: [snapping] Leave me alone. Hugo: [meekly] Okay. Okay, Quasi. We'll leave you alone. Victor: After all, we're only made out of stone. Laverne: We just thought maybe you were made of somethin' stronger. Frollo: For justice, for Paris, and for her own salvation, it is my sacred duty to send this unholy demon... back where she belongs! Victor: Oh, but that poor Gypsy girl. I'm beginning to feel the worst. Laverne: I know, but now don't you say anything to upset Quasimodo. He's worried enough already. Hugo: Yeah, you're right. We'd better lighten up. Victor: [as Quasi climbs down after ringing the bells] Shh-shh-shh! Here he comes. Laverne: Now just stay calm. Quasimodo: [approaching the window] Any sign of her? Quasimodo: No, he's right. What're we gonna do? Quasimodo: [singing] So many times out there / I've watched a happy pair / Of lovers walking in the night / They had a kind of glow around them / It almost looks like Heaven's light / I knew I'd never know / That warm and loving glow / Though I might wish with all my might / No face as hideous as my face / Was ever meant for Heaven's light / But suddenly an angel has smiled at me / And kissed my cheek without a trace of fright / I dare to dream that she / Might even care for me / And as I ring these bells tonight / My cold, dark tower seems so bright / I swear it must be Heaven's light. Frollo: [picks up one of Quasimodo's wooden figures] Isn't this one new? It's awfully good. Looks very much like the Gypsy girl. I know... you helped her ES-CAPE! Frollo: And now all Paris is burning because of YOU! Quasimodo: She was kind to me, Master. Frollo: [destroying all of Quasi's wooden figures] You idiot! That wasn't kindness, it was cunning! She's a Gypsy! Frollo: Gypsies are not capable of real love! Frollo: Think, boy! Think of your MOTHER! Frollo: [to Quasimodo] Quasimodo, can't you understand? When your heartless mother abandoned you as a child, anyone else would have drowned you. And this my thanks for taking you in and raising you as my son? Quasimodo: Oh, yes, Master. I would like that very much. Frollo: [nearly chokes] Excuse me? Frollo: And look what else I've caught in my net. Captain Phoebus, back from the dead. Another "miracle", no doubt. I shall remedy that. Hugo: What're you guys talkin' about? If I knew Esmeralda, she's three steps ahead of Frollo and well outta harm's way. Quasimodo: [doubtfully] Do you really think so? Hugo: Hey, when things cool off, she'll be back. You'll see. Quasimodo: [puzzledly] What makes you so sure? Laverne: Because she likes ya. Laverne: We always said you were the cute one. Hugo: [eating crackers and cheese] I thought I was the cute one! Laverne: No, you're the fat, stupid one with the big mouth! The Old Heretic: I'm free! I'm free! The Old Heretic: Dang it! Laverne: [to the pigeons] Don't you ever migrate? Phoebus: [to the Parisians] Citizens of Paris! Frollo has persecuted our people, ransacked our city. And now he has declared war on Notre Dame herself! Will we allow it? Phoebus: [holding her hand to his heart] I'm not so sure it didn't. Frollo: The sentence for insubordination is death. Such a pity. You threw away a promising career. Laverne: Knock it off, Hugo. She's a girl, not a mackerel. Frollo: [singing] Protect me, Maria / Don't let the siren cast her spell / Don't let her fire sear my flesh and bone / Destroy Esmeralda / And let her taste the fires of hell / Or else let her be mine and mine alone. Esmeralda: [singing] I ask for nothing, I can get by / But I know so many less lucky than I / Please help my people, the poor and downtrod / I thought we all were the children of God / God help the outcasts, children of God.